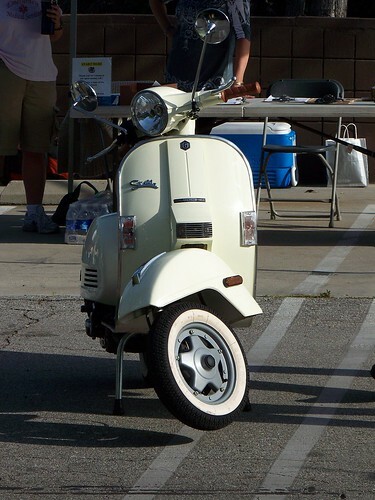 There have been few scooters to debut in the US carrying as much baggage as the Genuine Stella 4T (4-stroke). It comes preloaded with the stigma of being a 4T shifter and common perceptions of the Bajaj 4Ts as slow vehicles with a variety of quality issues. It's got a lineage that can be traced to Vespa but, as many people will complain, it's not a Vespa and it's built in India. As enthusiastic as some people are about the long-awaited arrival of a 50-state version of the Stella, others question whether there is a need or demand for such a thing. Others pre-judged the scooter long before even seeing it in person. On top of all that, delivery was delayed by a year due to the Stellas being singled out for additional inspections by Customs and the EPA (despite having already been approved for sale). During this time, there was all sorts of theorizing, rumor mongering and conjecture about Genuine and the state of the scooters. The conclusion? The EPA didn't like a ball of glue and the adhesive used for a label. At the center of all of this, the humble Stella 4T. Its roots are the Vespa P-series, the most utilitarian and (arguably) least graceful of the company's models. It's the workhorse of the stable. From the mid-'80s through the '90s, LML, the company that builds the Stella, manufactured Vespa PXs and LML variants (the NV and Select models) under an agreement for Piaggio/Vespa. The two companies ended their relationship in 1999, but LML was allowed to continue building its own versions of the PX, which became the Star. 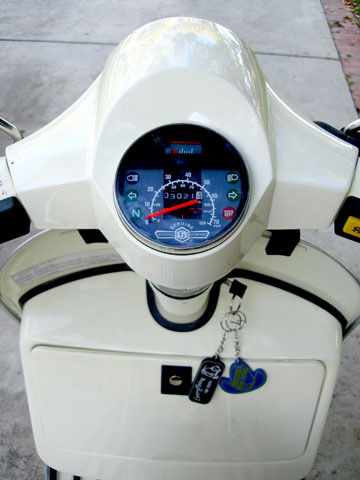 Genuine Scooter Co. began selling a rebranded version of the Star as the Stella in the US in 2003. The Star/Stella 4T is the result of years of collaboration between Genuine and LML. The original Stella was never sold in California, the country's largest scooter market, due to state emissions standards. Similarly, emissions controls have been tightening in Europe and Asia, and the 2-stroke version eventually would have been regulated out of existence. The new 4T engine reduces emissions, but also alters performance and necessitated some design changes. It's a whole new Stella, but also sort of not. Comparisons to the Stella 2T are understandable. Comparisons to the Vespa PX, inevitable. But as much as it resembles these models, the Stella 4T deserves to be judged on its own before the comparisons come pouring in. I've got just over 3,000 miles on my Stella 4T now, more than enough to give it a fair shake. 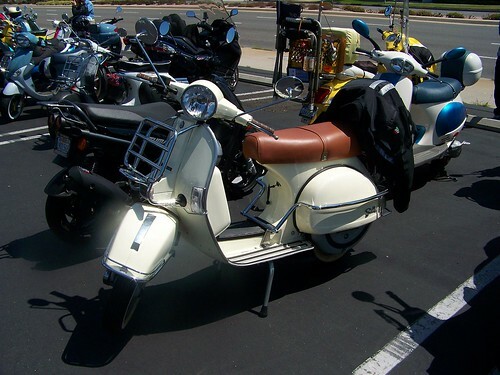 Prior to the Stella 4T, my daily rider was a Vespa LX 150 with a lot of performance modifications including a 191cc kit, performance variator, sliders, exhaust. I also own a Buddy 125, have spent a good amount of time riding Buddy 150s and have test ridden many other scoots. I'm 5' 10" and around 230lbs. Full disclosure: I got the scoot through an arrangement with my dealer and Genuine. It was used as a demo model and I got it semi-used for less than MSRP, 250 miles on the odometer. It had a couple cosmetic "blemishes" from having been lightly dropped a couple times and had been sat on by a couple hundred people, all of whom made "vroom vroom" noises while cranking the shifter. Slightly used, whatever; I was happy to have it. I took possession when the original Stella 4T shipment arrived in the US. No one thought it would be a year (rather than weeks) before they arrived at dealers. Neither Genuine nor my dealer has asked me to review the scooter or in any way influenced this review. These are my honest, uninfluenced perceptions and opinions. You can see the other colors on Genuine's official Stella 4T page. What's the difference between a four-stroke (4T) and a two-stroke (2T)? I try to explain it here. For those looking to get the basic scoop on the Stella without my ruminations, here are answers to most common and probable questions. I'll go into some of it in more detail later. ��For better or worse, it's very much not a "modern scooter" that shifts. In terms of riding and operation, there are few differences from the Stella 2T or a Vespa P.
��Yes, it's EPA rated at 140 MPG. I don't keep consistent track of my mileage but average around 100 MPG when I have. It's been a little higher in the summer, lower in winter. This may be due to warm up, revving the engine or California's different summer and winter fuel mixtures. Time will tell. ��It tops out around 60mph. 55mph reliably, no problem. 65mph downhill. With everything stock, it won't go over 65mph. No, it's not good for freeway travel, even if legal in your state. ��No major issues so far. When I took it, the clutch cables were stretched out and all out of adjustment from the aforementioned cranking of the shifter. I also needed the clutch worked on at about 1200 miles (IIRC); the plates were replaced. My technician has told me this was likely due to early riders abusing it, throttle abuse and so on. While I know the ins and outs of a CVT, I'm less familiar with the manual clutch and so can' provide much detail on this. ��Biggest positives: Faster than I thought it'd be, especially after break in. Handles great; no pulling to the side, very well-balanced. ��Biggest negatives: Didn't like stock whitewalls. They may work for some riders, but I swapped them for Michelin S1s after several months. Loud turn signal clicker. Evap system (more on this below). In terms of its physical appearance, the Stella 4T is nearly identical to its 2T predecessor. The form is inherited from its classic Vespa P-series ancestor: squarish legshield and horncast, hefty cowls. The most easily-spotted differences from the earlier Stellas are the louvers in the right cowl and the star-shaped wheel hubs. The seat and rear cowls are a touch longer, but will still work with most accessories (with a little modification). I have the complete Vespa PX chrome kit on mine and all it required was a couple of notches under the upholstery of the seat's bottom. No one would notice with the seat closed. A harder to spot difference is the two-piece chassis. This is a big departure from the 2T, an accommodation for the new engine and providing access to it. You have to look pretty hard to notice that the "monocoque" frame is now a "duocoque" with a tubular frame at the rear. It's completely unnoticeable while riding. I haven't separated mine yet, but may in the next week or so. Pics will follow. Though the Stellas lack underseat storage, the glovebox is very roomy. I can fit as much stuff in there as in my LX's pet carrier. Fit and finish on the Stella 4T are good; arguably better than the 2Ts but that may just be people expressing color preferences. In general, what you see will be on the same level as the Stella 2T. This isn't the super-slick ultimate luxury scooter though. It's more of a Jeep than a Cadillac; everything is designed for function. Kickstarts easily, first kick almost every time! The Stella 4T features both an electronic ignition and a kickstarter. It has a manual choke and a fuel petcock to turn the gas feed off, on or switch to the auxiliary tank. For those transitioning from an automatic scooter, the turn signals are on the right grip. (This takes some getting used to.) So, yeah, it works just like the 2T, right down to some of its idiosyncrasies. The fuel gauge is fairly inaccurate; I just haven't calculated how much yet. The Stella starts up pretty easily. It's warm-blooded though, and takes several minutes to warm up after a cold night. I never had any problems with this in the warm months, and think I may have just needed to adjust the idle a bit. I came to the Stella as a first time shifter rider. I'd ridden some MCs recreationally, and a Vespa small frame, once, over a decade ago. So as far as it goes, a total newbie. The info here is oriented to fellow new/never shifters but may be of use to others. Like most shifting scooters, the Stella has a clutch lever on the left and the left grip rotates to shift gears. The rear brake is engaged using a pedal on the floorboard. There's no tachometer; you know to shift by sound, feel, speed and instinct. My first impression getting on the Stella 4T: plenty of low-end torque. Enough to pull a really big wheelie my first time on it. Somehow, all my knowledge and experience from shifting cars went out the window in that moment, as in "don't hit the gas then just get off the clutch; ease into gear." Aside from that and some early bumps and issues, within weeks I was hauling around town like shifting was second nature. I still get stuck between gears on occasion and am always developing the finer skills of shifting. For the most part it's not as bad as many new riders seem to fear. Some riders say shifting provides more control than riding an automatic. I'm not sure I'd completely espouse that view, as there are subtleties to mastering throttle control on an auto. It does, however, provide another dimension to the human/machine interface, that bond between rider, scooter and the road. Both shifters and automatics have their benefits, but the Stella 4T has become my daily commuter (lots of shifting) while my Vespa is reserved for longer or faster rides. While I now appreciate how well CVTs are designed and work, there's a visceral thrill to shifting�running up the RPMs and banging into gear�that you don't get from an auto. A few downsides to shifting: It definitely takes more work to shift and requires a degree of attention not needed when riding an automatic. More than when driving a manual car, even, I'd say. On long rides with a lot of curves and hills (i.e., constant shifting) it can wear you out a bit. Also, it's a bit more physically demanding and I had to switch from using a messenger bag to a backpack because I my back and shoulder were aching. I carry a heavy load, but it's fine with a backpack now. For those with carpal tunnel or chronic back issues, a shifter may not be the best way to go. The first reaction many scooterists with any knowledge of past models will have to a 4T shifter: "It's going to be slow. Bajaj 4Ts were slow." Yeah, maybe, but that's kind of like saying "All cars with 4-cylinders are slow." Not all engines are created equal. I'd say the Stella 4T isn't slow; it's certainly faster than the Bajaj I've ridden alongside. Acceleration and speed is one of the areas where it makes sense to compare to others. Speed is relative. Off the line, it doesn't scream. It's closer to most stock 125s/150s than, say, a Buddy 125 which is very quick off the line. It's good enough for lane splitting and pulling away from traffic. I do find myself creeping into the crosswalk and getting ready to pull away when a light turns green more than on my other scoots. It accelerates nicely in 2nd and 3rd gears. According to this video from UK LML distributor Eddy Bullet, the 4T actually beats both catalysed (restricted) and derestricted, rejetted 2T Stars (Stellas) off the line. Hopefully, some shops in the US will try the same for comparison. What is surprising is how well the Stella 4T fares compared to many of the vintage shifters that I've ridden alongside at group rides. The Stella ably keeps up with all, and is as fast as most with the exception of the 200cc Vespas. It's faster (in top speed and acceleration) than a friend's VB with a P200 engine. It flew by a fellow rider who just rebuilt a P150. He was slightly gobsmacked and jealous. All those vintage faithful prematurely complaining about the Stella 4T's performance may have some newfound respect for them once they ride next to one. Or they'll just hate it because it doesn't sound and smell like a 2T. A dealer who had a number of riders try the Stella 2T before test riding the 4T told me that many preferred riding the 4T by the end of the test. Once the engine's broken in, the performance only gets better. While there was little-to-no gain in top speed, the acceleration improved and the engine took on a slightly deeper rumble. It's still pretty dang quiet while idling�more than my other 4T scoots. When I first started riding, I had to tweak the throttle at lights occasionally to make sure it was still running. There aren't a lot of performance parts available for the Stella 4T at this moment but it's only a matter of time before we start seeing more. Polini has a pipe and a 165cc cylinder kit coming out. A Pinasco pipe is currently available. Overall, the Stella handles quite smoothly. It's agile in turns and curves. It feels light and nimble. It doesn't pull to either side. Compared to a Buddy, the Stella feels a bit more balanced, with a higher center of gravity. Riding it up in the twists and turns of the area hills and canyons provided me with a better understanding of why this form has endured for so long. It's not just aesthetics or nostalgia; it works. The lean angles aren't as good as on some modern scooters, particularly those with taller wheels. The Stella's somewhat more likely to scrape bottom on a very tight/fast curve but doesn't have a protruding center stand or exhaust like most modern scoots. In general, it's very capable, but required some adjustment in riding style. As mentioned above, I wasn't keen on the Sava whitewalls that came stock on my Stella. Even properly inflated, they felt a bit squishy, a little slippery. (Keep in mind, though, that I'm a very aggressive and demanding rider and I'm accustomed to the high-performance racing style tires on my Vespa LX.) For whitewalls, I think the Maxxis tires (stock on Buddy 150s) are somewhat better. I eventually swapped to Michelin S1 blackwalls before the Savas expired, partially just to gauge the difference. While not dramatic, I find them to be "stickier" and grip better than the Savas and perform much better on wet surfaces. The Stella's brakes aren't spectacular but they're adequate. As with most scooters, most stopping power is in the front brake and the front disc is comparable to stock discs on most other scoots. The rear drum brake is a bit softer. The pedal on the floorboard doesn't have the degree of control that a brake lever does. 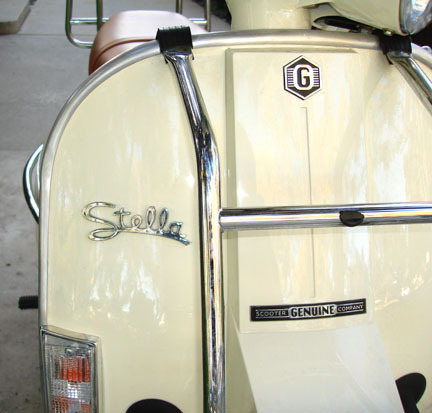 Hard stops are not as fast on the Stella as on most modern scoots. I've learned to give myself a bit more braking room and distance between myself and other vehicles. Like all scooters intended for sale in the state of California, the Stella has a mandated evap system, intended to reduce emissions by recovering and recycling vapors. This system is problematic for many scooters and motorcycles. 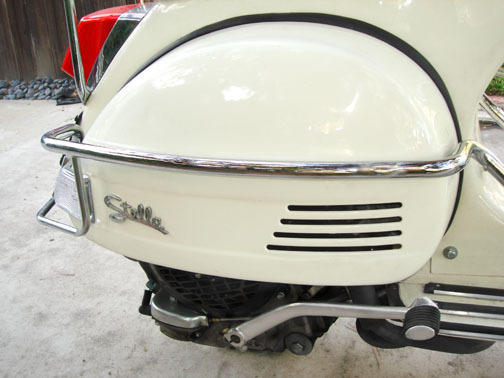 When you buy a modern Vespa, the first piece of advice you often get is to disconnect the evap hose, as it causes rough idling, starting issues and stalling. So, Stella 4T buyers outside California, my first piece of advice is this: Disable the evap system. California's Byzantine mandates simply don't work with most scooter and gas tank designs. The effect on emissions will be negligible, especially on the already very clean Stella. For those of you in California, disabling the evap system is illegal. Although the odds of getting caught are almost nonexistent, it would be irresponsible of me to suggest you take this action to prevent (for example) gas splashing into the hose and causing a vacuum/vapor lock stall. UPDATE, 3/28/11: Happy to report that there are many Stella 4Ts on the road now and there have been no reports of evap system issues so far! So, for now, I say: Don't mess with it. I frequently read or hear people saying, "If you want a Stella, great, but it won't be as reliable as a modern auto." This is one of those oft-repeated lines that may have a smidgeon of truth, but is probably exaggerated. 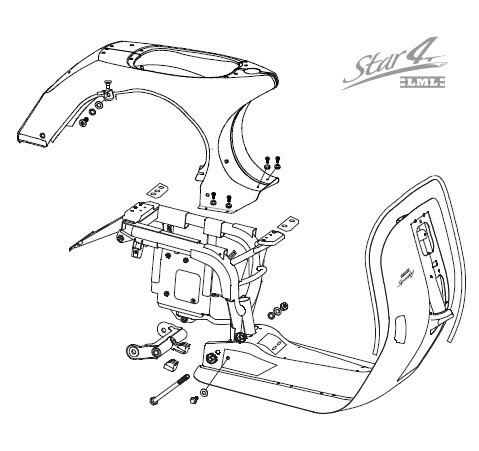 What is true is that the Stella 4T requires different maintenance and more frequent adjustments. The cables need tightening every couple thousand miles. 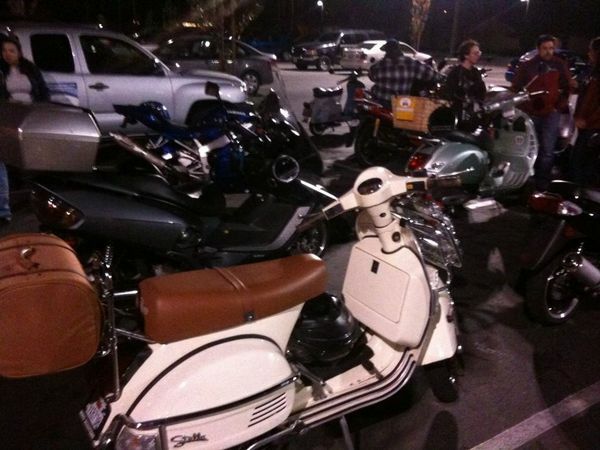 The Stella 4T should appeal to a diverse selection of buyers, but it's not the right scoot for everyone (no scooter is). These are just a few things to help guide you if you're considering buying one. That said, you could be on the "probably not for you" side of the criteria, get a Stella, and fall in love with it. There's no accounting for the je ne sais quoi factor and sometimes a scooter can work its magic on you despite all reason. Many potential buyers may wonder if the Stella 4T will make a good first scooter. Their primary concern will likely be shifting. All I can say is this: For 50 years, the large majority of people who learned to ride scooters did so on shifters like the Stella. Take the MSF Basic Rider Course. Get a dealer or friend to teach you how to shift and give you a few lessons. Be patient and practice. Five decades of scooterists were no more predisposed to riding than you are. i think its a very nice looking scooter, and would love to have one to "shift" one day. i also think it's good that it feels "vintage" in character. imo, that is one of the major allures of the Stella. it is "new," yes. but it is also old, and takes a rider back to another time, but with a two year factory warranty and dealer support. it should feel somewhat rough and tumble imo. if it were more refined in operation some of the excitement of riding one would be taken out of it, most likely. and yet others would argue "its a fake!" Ha, I accidentally posted it while still editing and adding pics. If anyone has questions I'll do my best to answer and incorporate what I can into the review before moving it into the Reviews section. Nice review( as usual )and you've "scooped" the mainstream motorcycling press too! Thanks! I'm still cleaning up some typos and editing it but wanted to get it up as soon as I could. Nice to see such a comprehensive and well-written review, Eric (though -- compulsive proofreader that I am -- I did catch a few typos that made it through spell-check). You certainly write better than most of the gearhead automotive journalists. "You do not need a parachute to skydive. You only need a parachute to skydive twice." I didn't think I could possible want one more. Terrific article Eric. Even more anxious to get on my own Stella next week. Sounds like break in went well - what method did you use? Mfg directions? Variable hard riding (fartlek)? Other? Went for the "hard" break in. Vary the RPMs, no sustained WOT/high RPM riding for first 600 miles or so. Figured this didn't need to be any longer! I know keeping gas mileage is not your thing but would be nice if you did for a couple tanks just to give an idea. Just a thought, otherwise enjoyed reading and pics! I have a question about appearance. they don't look brown anymore. is that correct? or it is something wierd in the photo? or did you switch them out? do they collect dirt and smudges really easy? And one more question, regarding the stock headlight. since you have driven other scooters- how does the stock headlight compare to say, the buddy or others, for night scooting? The grips are just dirty from my even dirtier gloves. The headlight is okay. I do about half my riding at night, but in the city, and it's definitely adequate. The beam is fairly yellowish. It's probably not as bright as the headlights on the current Buddys, which are quite good for stock incandescent lights, IMHO. I'll probably swap it for a brighter, whiter bulb eventually, but it certainly meets my needs for now. I got a decent GPS iPhone app (Cyclemeter) so will be doing some testing with that. One reason I didn't get too specific with MPGs is that I wanted to verify the odometer accuracy. From this morning's commute, though, it appears that the odometer and speedometer are both fairly on the mark! I won't make any solid conclusions from just one test, but am kind of surprised at how close they are. Excellent review man. Makes my wife want one even more. I think we all owe Genuine Scooter Company a BIG thank you for the perseverance they shown in getting us the Stella into the States.I know they jumped thru some hoops on this one.To think we get to continue our love affair with a vintage era scooter is just so cool. Thank You Eric for your continued dedication to the scooter world. PS-LML Star.Look at the 2nd pic down in the OP,see the front rim? Someone somewhere looked upon the rim and thought "Star" Ah ha I figured it out. Typos let us all know your hunam! Great write-up Eric. Thanks for the very thorough review. ...PS-LML Star.Look at the 2nd pic down in the OP,see the front rim? Someone somewhere looked upon the rim and thought "Star" Ah ha I figured it out. That reminds me- so the Genuine Stella 4T's have a Star hubcap? or is that just the LML Stars? I know yours does, but I heard the shipment ones will not have the 'star'. Great review! Appreciated the helpful discussion on shifting. Hadn't heard that but I may know for sure in a couple of hours if they're uncrated by the time I get to my dealer! Yup, I just witnessed The Uncrating of the Stellas, an event as joyous and sacred (to me) as the Blessing of the Animals (or maybe the Blessing of the Bicycles). Star hubs! The yellow color looks much nicer than expected in person. Really more of an orange-yellow. We discussed putting black diagonal stripes on the side and making a Caution Stella. 1979 Honda CT90 - For Sale! That can only make me think of one thing. The color's pretty close, actually. Hm, wonder if it's possible to do a headset swap and get a trapezoidal headlight? Galactic Patrol Stella! I think my fiancee, a 3x larger manga freak then myself, would pass out on sight if I pulled a headlight swap, added the sticker, and rolled up to her apartment on that thing. I had my doubts about four-stroke's ability to produce power, but if the Bajaj Chetak is any indication of a Stella's accelerative abilities, I've nothing to worry about. I wasn't able to compare the seat on the 4t to a 2t seat, but i know the 4t has that raised gas tank. Do you think there will be a way to put one of the Super Corsa seats on that scooterworks has on the site? The regular corsa will be too low for clearance for sure. Posted: Sat Mar 19, 2011 3:20 pm Post subject: damn and blast! Thank you for the review. While i love my Blackjack 'Sally', I keep checking my bankbooks and investments and thinking about a real 'old timey' style scooter. Not only has the shop in my area said they would sell me a 2stoke stella for 2999 (before ttl...and is very tempting) your review makes me want a 4stroke even more more more! ARRRRGHHH! I chose my Blackjack because my previous scooter was a 2006 black & silver Buddy 125, and when I test rode several different scoots (The kymco Like, the 2011 Blur, and one other that I don't recall) the Blackjack just felt right, you know? But always in the back of my mind I keep thinking about the Stella, and just how overall cool it is. So thank you for your review, but rats! now I want another toy! "This one's faster than yours." Words I hate hearing. This was in regard to another Stella 4T which had been tuned. A friend who'd ridden it said it was faster than his P200. Guess I need to look into a few adjustments! great review. Who knows maybe I will have one of these one day. After the news about the delayed cruiser I might put this in line for succession should the Buddy or GTS need to go to pasture one day . Although that said it it hard to imagine 2 more perfect scooters (for me at least) than these two and I would repurchase either in a heartbeat if funding were available. In the justgottascoot podcast it was mentioned that there were changes coming up with the stella. I am sorry the opportunity was missed to interject and get more info on that. I heard correctly right? I was just going to ask about that too. Yeah, it was just a short mention in the interview of some new edition of the Stella available, (along with the cruiser, fingers crossed) in 2012. Anyone know what this is in reference to? Bigger engine? Two-tone colors? Cassette deck? Betcha it'll be a special edition of the 150. This is what they've done in the past. Updated 3/28. I may have been too hasty in my judgment of the evap system. So far, no new owners have reported issues with vapor lock or other common problems from the evap. So, for now, I recommend leaving it as-is unless there's a problem with it. Do it!!! Some things in life are worth the trouble and that project is DEFINITELY one of them. Do it! Do it! Do it! So do you have a more finite idea of actual mpg yet? Ouch! Now that's just poor timing, KrustyB. Holy crap! I've always had really bad timing with stuff like that! SORRY ERIC!!!! I try not to read the crash thread. LOL. That's okay! Other riders are getting around 100-120MPG on new, not-yet-broken in ones. I need to calculate mine; I just have a lot of phone pics of my odometer and gas pumps! You saw the humor in that too. That's a good sign. Filled up, not into the filler neck. But then I went up a long hill. The bike started to sputter and miss after it levelled off and my gf (following on her scoot) said she saw a little fluid spill from the rear mud guard. After a few moments, the bike ran fine. But now I'm thinking that this could happen again the next time I go up a steep hill with a close to full tank..
Looks like I'm gonna be 'modding' the EVAP. I "adjusted" mine the first week. I also fill my LX tank to the brim and have vapor locked it once, even with the evap disconnected. I filled it up for a long trip, then started up Big Tujunga. Hit a bump going uphill and just stalled it out. Posted: Fri May 20, 2011 9:29 pm Post subject: Not recommended to drive Stella on highway? With a PX 200cc, we do ride on highways. How about with a Stella 150cc? Posted: Fri May 20, 2011 9:33 pm Post subject: Re: Not recommended to drive Stella on highway? I'd ride on a 2-lane, 55mph highway. I wouldn't ride on a large, 65mph freeway where everyone's driving 80mph. The Stella tops out at a little over 60mph, but on an incline you'll lose speed pretty fast. In my opinion, riding in conditions that require sustained speeds of over 60 isn't the right place for the Stella. Every darn time I see a reference to FLCL I end up having to click on YouTube to watch the closing credits. Granted I don't mind this at all, but the instant I see that P! sticker my brain starts humming "Ride on Shooting Star." Granted I don't mind this at all, but the instant I see that P! sticker my brain starts humming "Ride on Shooting Star." I do a horrific in the car, try to sing along phonetically, shout the chorus because it's in English karaoke version of this song. "Ohhh ruuuu maaachhoooo NAYYYYHEYYYY!" Or something like that. A couple years ago I met some much younger cousins for the first time and learned that they're musicians. They were signed to a Japanese label and toured with the Pillows and a bunch of other J-rock bands I know solely due to anime soundtracks. So of course I totally geeked out and was instantly the weird old cousin who has more in common with the kids than their parents, who I'm closer to in age. 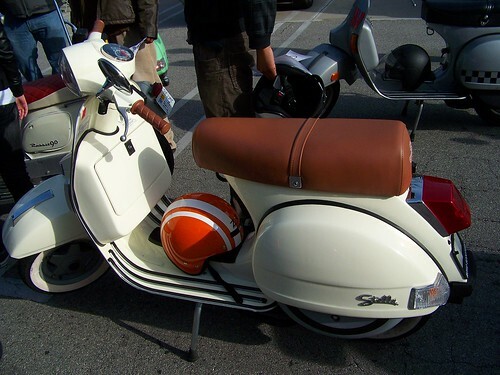 amazing post which led me to the purchase of my new stella over another vespa, but could you post another picture or two of the rear rack you have, maybe also the notches you spoke of and without the jacket on top of it so i can see what the rear rack you have? Thanks! This rack is a Vespa OEM rack for PXs. Came with the full chrome kit. Rear rack was the only thing I salvaged when this scooter got totaled! Thanks for the response, It is close to what I was looking for, I need one very similar with a back rest pad on it preferably. How do you feel now...? Still happy with it..? Any problem getting maintenance parts..?